Former US presidents Bill Clinton and George Bush Senior have visited Indonesia as part of a tour of areas affected by December's tsunami. After a brief meeting with Indonesia's President Susilo Bambang Yudhoyono, the pair flew to the devastated province of Aceh to speak with survivors. They arrived from Thailand, where they had urged the world not to forget the victims and the reconstruction effort. The two men have been asked by the White House to raise relief funds. They are now on their way to Sri Lanka, after which they will travel to the Maldives. Their first stop in Indonesia was Medan, the capital of North Sumatra, where they were greeted by Mr Yudhoyono for a private briefing. 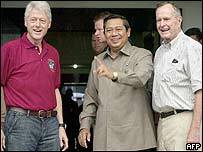 Mr Yudhoyono told reporters: "Both former President Bush and former President Clinton expressed that the people of America are interested in assisting and contributing to their brothers in the disaster-affected areas." Mr Bush and Mr Clinton travelled on to Banda Aceh, where they inspected the damage and visit some of the refugee camps where tens of thousands of survivors are living. "We hope they can give help to us like food, schools and health," Jamaliah, a 30-year-old refugee in Banda Aceh, told Reuters news agency. Mr Bush and Mr Clinton then visited Lampuuk, which was flattened by the tsunami, and covered with mud and sand except for its mosque. "I've never seen anything like this in my entire life. Ever," Mr Bush said, the Associated Press reported. The BBC's Rachel Harvey in Banda Aceh says security is a major concern, after three major attacks by Islamic militants in the past two-and-a-half years. The province is the scene of a continuing conflict between Indonesian security forces and separatist rebels. The two men began their tour in Thailand. "It's very moving... I'll never forget this," Mr Bush said on Saturday at a news conference in the Baan Nam Khem village, just north of the Thai resort of Phuket. He was speaking after a little girl whose mother was killed by the tsunami gave him a picture, showing her village being struck by the giant waves. Mr Clinton also came close to tears after receiving a similar drawing from another child in the village which lost half of its population - at least 2,500 people. Mr Clinton said that those affected by the tsunami should not be ignored when the cameras had gone. "What we have to do is not to forget... see this thing through," he said. The two former leaders warned that as much as $4bn (£2bn) in aid was needed in addition to $7bn (£4bn) already raised privately and by governments around the world. They also said they wanted to make sure the fund would be spent properly. They laid a wreath at a memorial in Phuket to those who died and visited an international centre for identifying bodies.